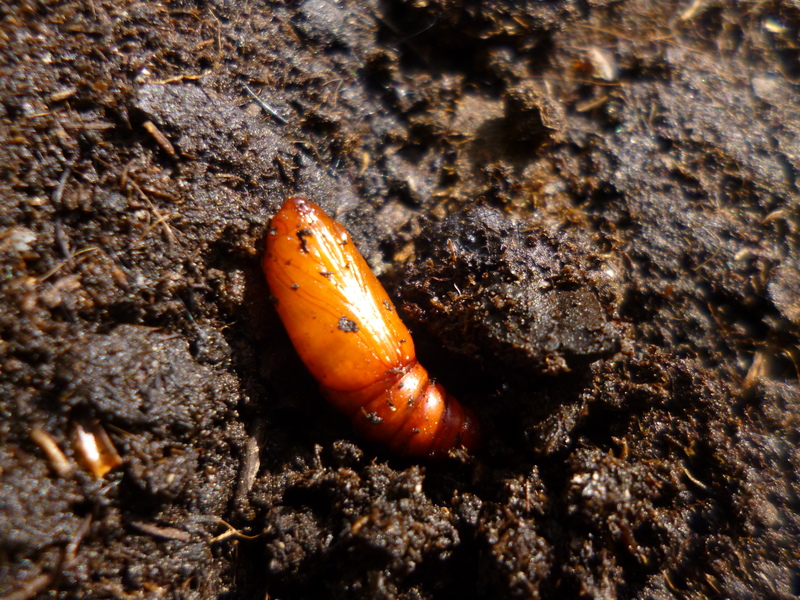 As luck would have it when I took a trowel full of soil out of one of the raised beds this morning so as to plant another seedling, I found this sleepy head buried deep in the soil. It’s striking colour stood out against the earth. Turns out it is a pupa of the Agroti puta puta moth that will wake up soon and be active for a few months. The caterpillars themselves are not fussy eaters and feed on any low-level plants in the garden. Since it’s not that harmful I just moved it out of the bed and into another part of the garden. I prefer to garden without pesticides, especially when it comes to growing food, so am trying more natural alternatives. Hand picking pests off is just one way! Up to now, I’ve been lucky (touch wood!) not to be plagued by major pests but there have been a few along the way. Just the other day I noticed one of the raised beds had got lots of black ants in it. Not a major problem in itself but they can cause problems if they harbour aphids which can happen. Knowing why the pest is there can sometimes help solve the problem. In this instance, ants prefered the dry warm soil in which to build their nest. So to make the bed a bit less appealing for them, I’ll be keeping the soil a bit wetter than usual and on top of that will sprinkle on some used coffee grounds and mint from time to time which they’re not so keen on either. Hopefully they’ll eventually decide to move and find another more suitable location for their nest. At least in the meantime the coffee grounds will double up as a nice fertiliser for the plants! 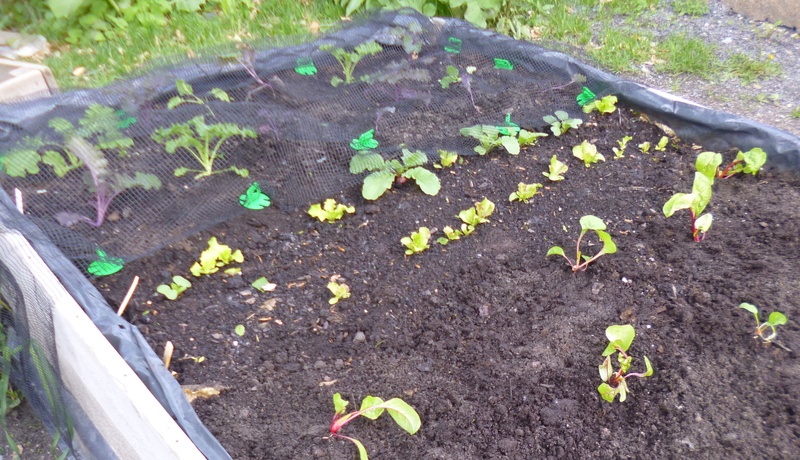 As a precaution this year, I’ve decided to put a layer of light fine netting over the kale. It stops the cabbage white butterfly from being able to land and lay eggs on the underside of the leaves. It may not look so pretty but it will hopefully protect the kale from hungry caterpillars. The kale suffered a little last year towards mid summer, so I’ll see how this works out this year by comparison. Categories: Food growing, Raised beds | Tags: Agroti puta puta, ants, fine netting, pests | Permalink.